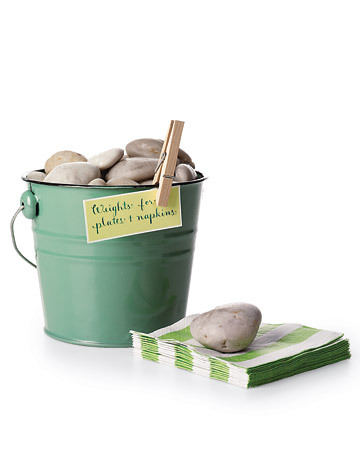 River rocks (available by the bag at garden centres) help keep plates and napkins where they belong, even after they’ve left the serving table. Pile them in a bucket on the buffet table for guests to grab along with their utensils; you’ll avoid having to chase fly- away’s. A guests wineglass wont end up in the wrong hands when one of these brightly coloured rubber bands identifies it. 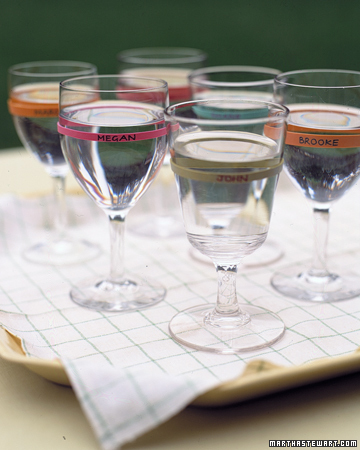 Use a permanent marker to write your guests names on the bands after placing around each glass. 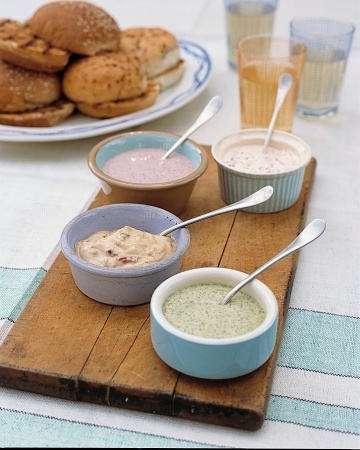 Beef up your condiment offerings for burgers and sandwiches with these four easy blends. Start each with 1 cup mayonnaise and 1/4 teaspoon salt, then add: peppers (1/4 cup, finely chopped); Kalamata-olive puree (3 tablespoons); sun-dried tomatoes in oil (1/4 cup, drained and finely chopped); or pesto (3 tablespoons). Don’t leave mixes outside for more than two hours; refrigerate in an airtight container for up to five days. 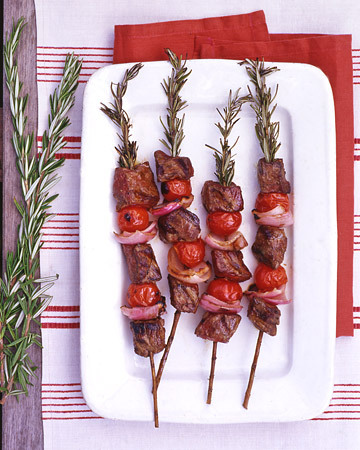 With its sturdy stalk, rosemary makes a great skewer, infusing grilled food with its garden-fresh flavor. Soak stalks for a half hour before adding meat, fish, or vegetables. You may need to poke through the food first with a metal skewer. Posted in Outdoor Living and tagged alfresco, mayonnaise, Olive, outdoor dining, outdoor living, river rocks, rosemary, Rubber band, wine glass. Bookmark the permalink. One thing I love about Summer is eating outdoors. 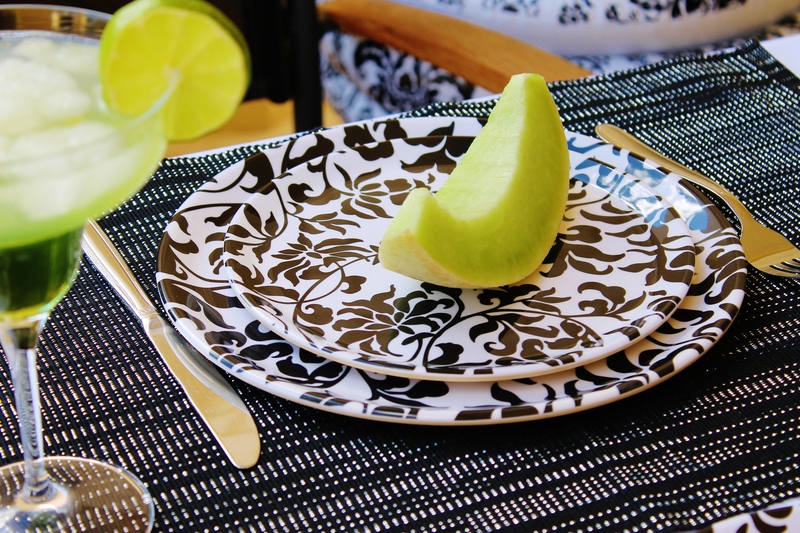 Evenings seem to stretch further when you are sitting outside enjoying a meal with the family, it is one reason we decided that melamine / bamboo dinnerware an absolute must to stock on our website and it continues to be one of our most popular lines. 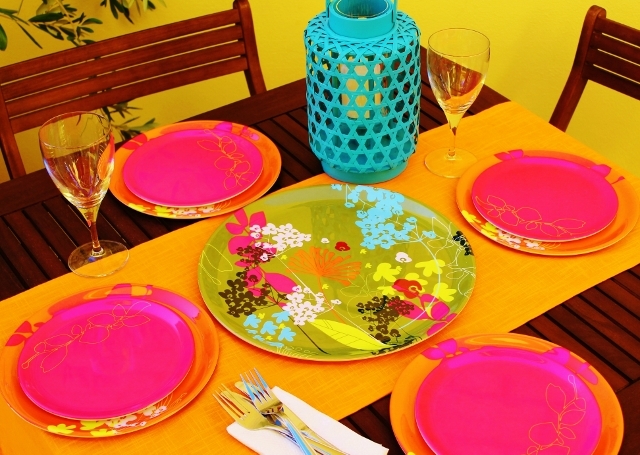 For anyone with kids the durability is great or even if you want something a little more stylish than plastic picnic plates melamine really fits the bill for dining outdoors in the Australian Summer. 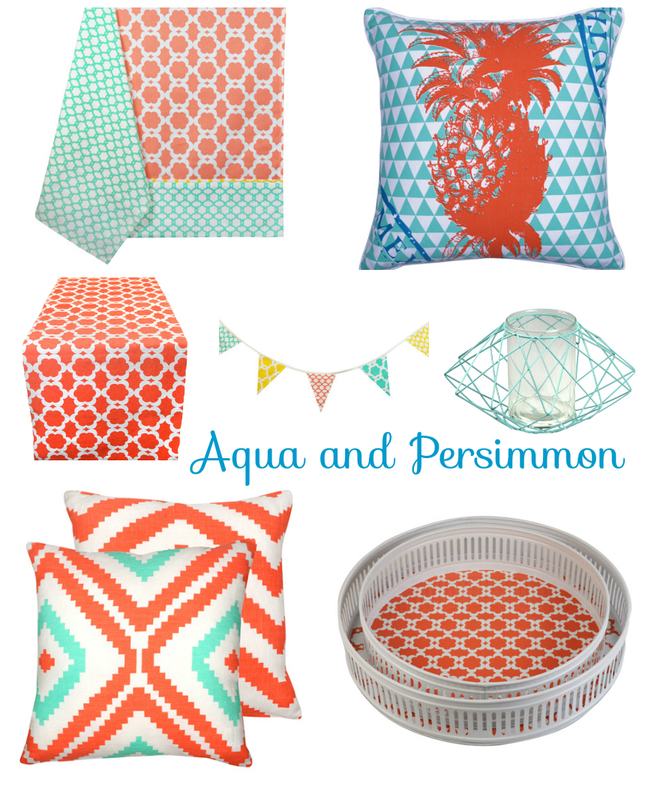 The range of vibrant patterns available now make a fashionable addition to your outdoor table. We make sure our melamine exceeds all Australian standards and is imported from the U.S.A. where strict F.D.A. testing makes sure the products are safe. We also have an eco friendly range of 45% bamboo 55% melamine plates. Check out our range at www.urbanspice.com.au and enjoy your weekend! 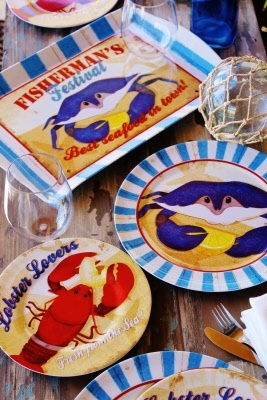 Posted in Outdoor Living and tagged Bamboo, Business, dinner, dinnerware, Environmentally friendly, Furniture, Home and Garden, melamine, melamine dinnerware, outdoor dining, Shopping, Tableware. Bookmark the permalink. House and block sizes are shrinking. 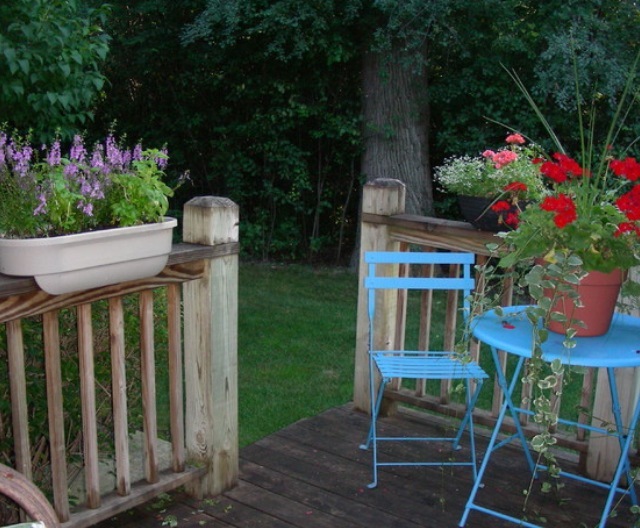 Gone are the days of the quarter acre block and big back yards that most of us grew up with. New housing developments have ever decreasing block sizes that favour two story dwellings that give us all the house size we need but with less outdoor space. 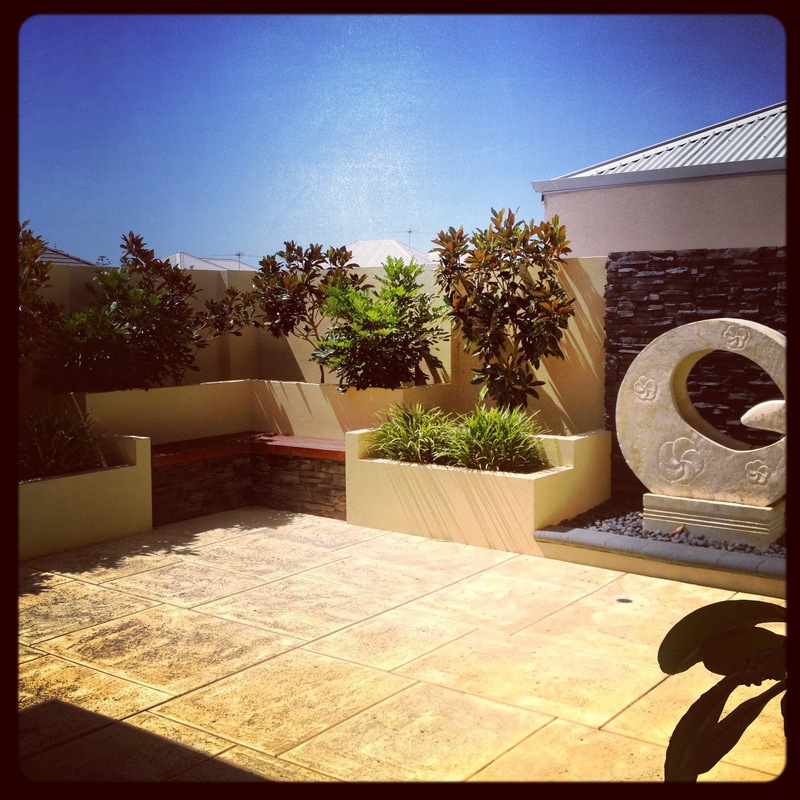 Designing a courtyard space can be tricky as it needs to accommodate a number of different uses, a seating/dining area, lighting, outdoor kitchen and some free usable space are things on most peoples wish lists. Fitting all these functions into a small space though can be challenging. I would like to share with you some tips that I have picked up along the way having lived (and currently living) in a house with a courtyard. Firstly make a list of the things you consider most important in your space, this can be something as simple as a place to sit, table e.t.c.and work from there adding in other wants, this will at least give you a clear starting point. Your walls surrounding the space are your biggest asset, whether they are timber fencing or brickwork, both can be utilised in a number of ways. Floor space in courtyards is most important so by making use of your surrounding walls this free’s up the available floor space. The possibilities for walls are endless, they can be used for suspending planters to give you an instant garden, you can wall mount a water feature (a flat water wall style works best), you can hang a mirror which will create instant depth to a really small space. If there is enough floor space against the wall you can even build in brick/rendered planter boxes to lift your surrounding gardens to free up more space and gain extra height in your plantings. 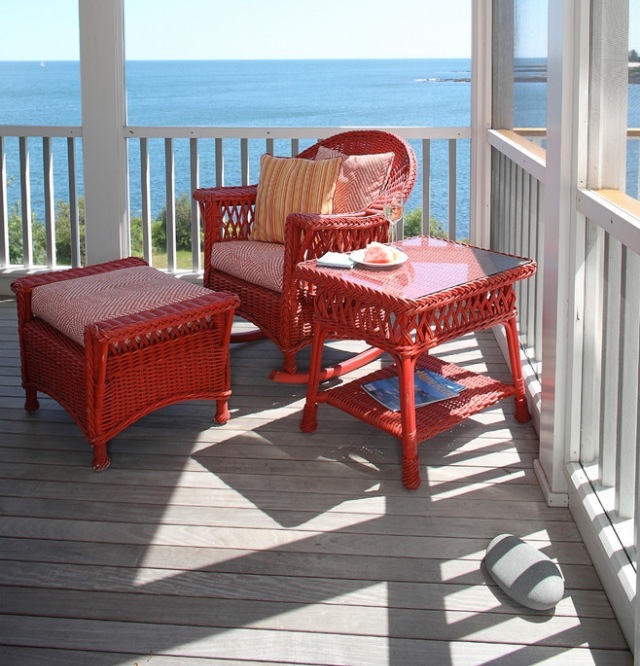 Seating and dining is another area that is a must, but try and resist the temptation to buy oversized outdoor furniture as this will shrink your usable space, take it from someone who made this mistake! 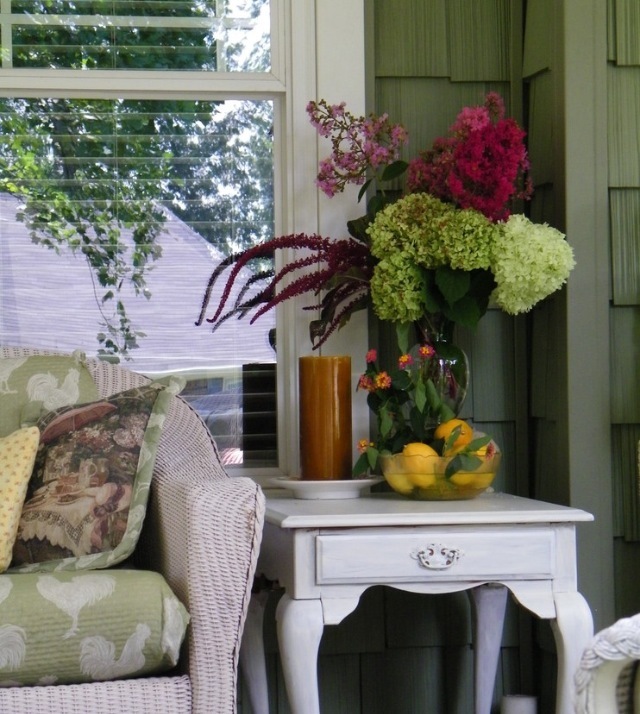 A smaller size setting in proportion to your space is the best option and lets face it you can always bring indoor chairs outside for the occasions when you have a larger group of visitors. 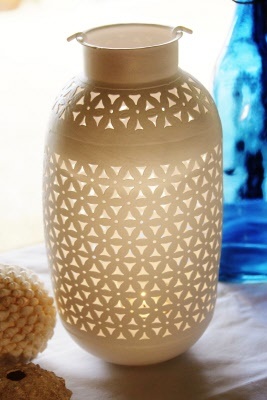 There are also a lot of great solar lights that will throw off enough glow at night by adding them around your planters/pots and a well placed candle lantern in the middle of a table. If you would like your outdoor space to function for cooking the occasional B.B.Q. there are an endless amount of table top B.B.Q.’s and smaller Webber type models on the market that will fit the bill without having to take up valuable floor space with a large B.B.Q. 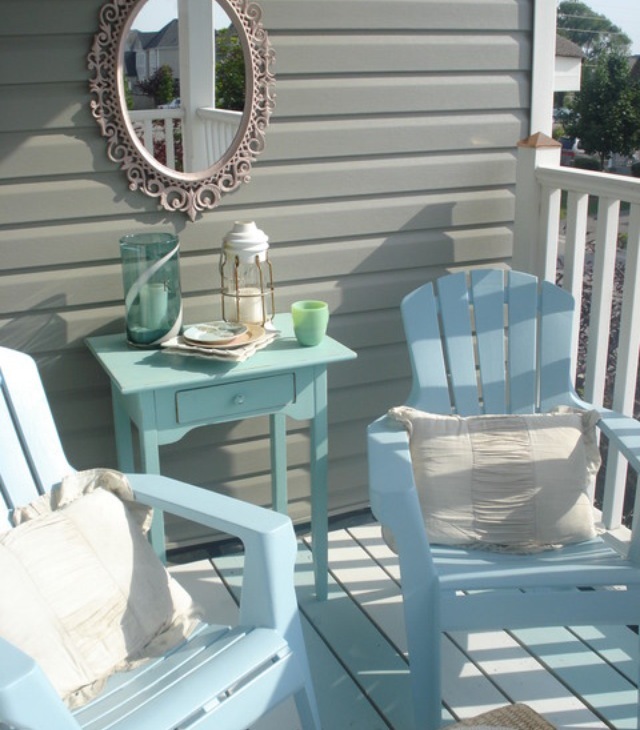 Probably the best piece of advice I can give you is collect pictures of outdoor spaces you like the look of and try and recreate the look, its always good to have a visual starting point and your personal style will evolve from there, with all the great picture resources like Houzz and Pinterest around these days there is no end to the possibilities. 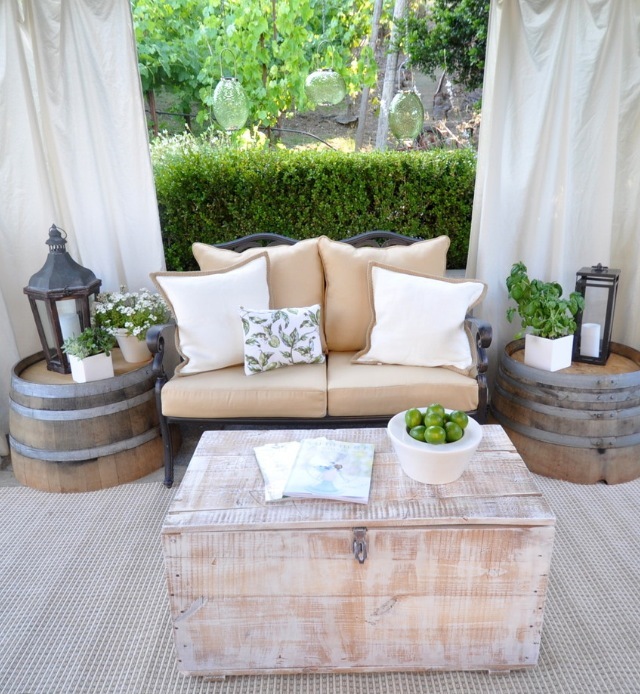 Posted in Outdoor Living and tagged alfresco, courtyard, Outdoor area, outdoor dining. Bookmark the permalink.